today is a google holiday, hooray! | six words to change the world. today is a google holiday, hooray! 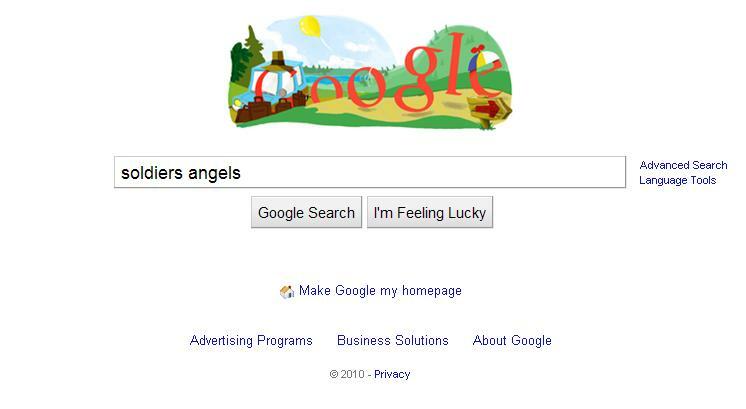 What I was Googling: soldiers’ angels. My roommate recently signed up for this program, through which you can write soldiers letters, send them care packages, etc. It sounds like an awesome idea, and what I like best is that you are connected with an individual soldier (rather than writing a generic letter to an unknown person). Take a look, if you’re interested! Enjoy the first day of summer, everyone! I feel like I should go get a Slurpee and watch The Price is Right after swim practice, a la 1995. Slurpees ah la 1995; victim-blaming of oil soaked pelicans; comic sans gets in yo’ face; and kitten in wee hat gets jumped? This blog has just made my week. And that comment maybe just made my week.